Founded in 1981, IGT – International Game Technology – has become a world leader in the supply of game machines and monitoring systems. The company designs, develops, manufactures and distributes computerized gaming machines to many locations around the world. IGT is probably the most widely recognized provider in the United States, with 7 out 10 games in the country being IGT machines. Based in Reno, Nevada, IGT boasts corporate and production facilities that sprawl over one million square feet. In addition, the company employs over 5000 people worldwide. Besides its North American market, IGT is steadily increasing its global locations, with IGT products to be found in Africa, Australia, Asia, Europe and South America. As the world becomes smaller, the globetrotting gambler will be thrilled to find his or her favorite IGT game in almost any gambling location on earth. IGT is probably most famous for it association with slot machines. The company made history in 1983 with the development of the first solid-state spinning wheel slot machine that came to be known as the M Slot. IGT rapidly improved on these early slot machines by introducing sound and lights, five-reel games and multi-line bets. Its popular Megabucks dollar slot game, using the MegaJackpots concept, was adapted to incorporate over 30 other systems. To date, MegaJackpots have awarded over $3-billion in prize money and have created hundreds of new millionaires around the world. Most people associate IGT with slot gaming machines and the company continues to earn prizes and awards for top games in the industry. IGT’s team of gifted creators churn out exciting, themed slot games that keep the company in the top ranks of the gaming market. Undoubtedly one of the company’s most popular games, Cleopatra was voted the best IGT slot game by the “Strictly Slots” magazine in its 2004 “Best of Slots Survey”. Cleopatra combines the ever-popular Egyptian theme with top of the range graphics and sound to bring players an exciting gambling experience. 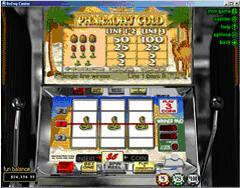 Cleopatra can be played in a range of styles, including the classic five-reel games, as well as the Game King video slot versions of the game. The Game King version can either be played as a five-reel, nine-line game or, alternatively, as a five-reel, twenty line game. Lucky players have won massive prizes through Cleopatra and small denominations (starting with one penny) allow gamblers to stand in line to win big. With bonuses and jackpots very much part of Cleopatra’s allure, it is easy to understand why this remains one of IGT’s most sought-after games. IGT has managed to turn the nation’s longest running television show into one of its most sought-after slot games at gambling locations. IGT offers The Price is Right in penny, nickel and dollar versions and players stand in line to win prizes of up to $10,000. There are five different machines based on The Price is Right, all featuring five-reel, nine-line games. What makes each version unique is a special bonus featuring one of the games from the original game show. Even for those who were born long after the show hit our TV screens in 1972, IGT’s The Price is Right is a firm favorite at land casinos. Also based on a popular television show, The Wheel of Fortune is definitely worth checking out on your next visit to a casino. There are several versions of this IGT game, with the latest video slot versions among the most sought-after in the country. Check out IGT’s new three-wheel, one credit multiplier “Red, White and Blue” version for some serious fun. Depending on how much you choose to bet at the Wheel of Fortune machines (anything ranging from a nickel to $5), players stand in line to win between $200,000 and $1-million through the base jackpots. IGT continues to release new games and series at a remarkable pace. The gambling world has become increasingly competitive, especially with the online casino market vying for a piece of the proverbial pie. As a result, casinos have to keep introducing new, exciting and top-of-the range games if they want to keep their clients happy. Casinos who purchase gaming machines from an established company such as IGT know that their clients will keep coming back for more and, to date, IGT has not disappointed anybody yet. Using exciting new technology, IGT has brought the thrill of the classic spinning reel machine into the next millennium. The S-2000 Series uses an 80960 processor to provide players with all the excitement of the original S-Plus slot machine but with the added advantages of serious hardware enhancements. New features include awesome sound effects, improved lighting features and numeric LED displays. Triple Lucky Strike Slots – a five-reel, nine-line 45-credit, penny game. Triple Double Red Hot Strike Slots – a five-reel, nine-line, 450-credit penny game. Double Classic 7’s Slots – a three-reel, five-line, 5-credit game that takes 25c and $1. Pharaoh’s Gold is one of IGT’s hottest new releases and is a variant of its ever-popular Pharaoh’s Fortune game. The game is a classic three-reel, three-payline with the added bonus of wildcards. There are four winning combinations when playing Pharaoh’s Gold, although players can increase their chances of winning as the eye symbol is also considered a wildcard. Minimum betting on Pharaoh’s Gold is a dime, while high rollers can try for as much as $5. 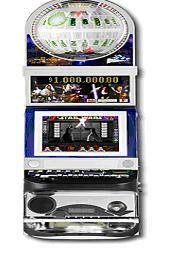 The thrill and power of this epic movie is brought to life in one of IGT’s most popular games to date – Star Wars. The game uses classic characters from the movie to bring you hours of slot entertainment, with its five-reel, 30-line features. Using IGT’s Game King Advanced Video Platform Technology, Star Wars offers advanced 3-D hardware-accelerated graphics and a high-performance digital audio sound system to ensure that your game playing action is as thrilling as the movie. Add to all this the fact that Star Wars is a 1 penny game, and it’s easy to see why the game has so many rave reviews from satisfied gamblers. International Gaming Technology seems dedicated to keeping its gambling public happy by providing exciting, original and contemporary theme-related games. Over and beyond the creative ideas that its games division continues to surprise us with, IGT is committed to staying one step ahead in the technology arena as well. The company is always seeking new ways to bring us the perfect combination of excellent audio, graphics and game ideas. It is no wonder that this company is considered the foremost supplier of gaming machines in the world today.